First a little bit about files on your computer. Think of your computer as a file cabinet. The file cabinet has drawers, and in the drawers there are file folders, and in those folders are files. Sometimes there are even folders in folder, like you might have some manila folders inside those green hanging folders. Your computer works the same way. Files on your computer are put somewhere. Think of each place you put a file like a folder in your file cabinet. If your boss tells you to go get a file, you need to know where it is. So it is important when you save things on your computer to be sure to look at where you’re saving it, or in our file cabinet analogy, which drawer and folder you are putting it in. To make it easy, I like to just make new folders on the desktop so I can find them easily. When editing video, you may need various files, like the video file, maybe some picture files and maybe some song files if you want to add music. So on your desktop, make a folder and name it whatever you like, but maybe Hot Wheels Videos would be a good suggestion. To do this right click with your mouse and a window should pop up with some choices. Choose “new”. A bunch of other options will come up with “folder” being at the top. Choose that one. 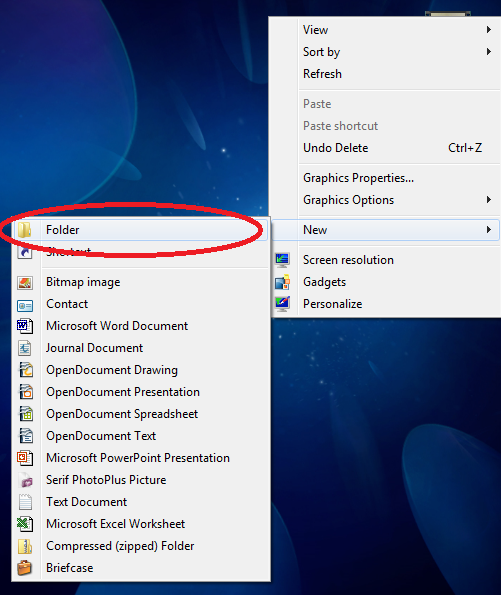 A folder should appear on the desktop and the name will be highlighted in blue. That means that it is ready to be named. Just start typing what you want to call it. It will type over what is already written there. 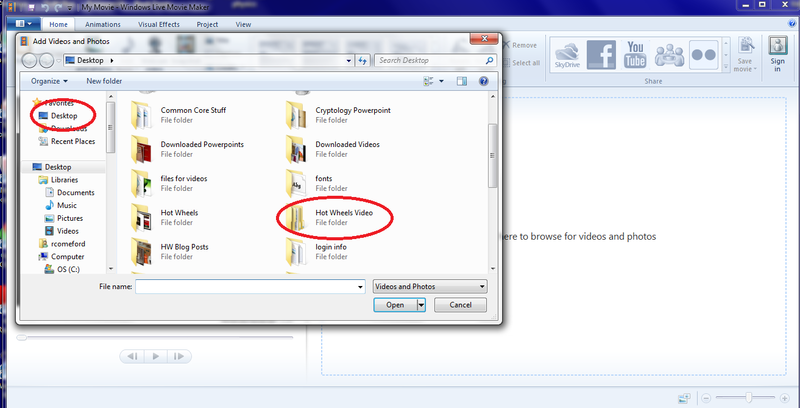 Now you have a folder on your desktop called Hot Wheels Videos…or whatever you called it. The desktop is like the drawer in the file cabinet. The Hot Wheels Videos folder is like a green hanging folder we put in the drawer. Now let’s put some manila folders in our green hanging folder. Double click on the Hot Wheels Videos folder to open it. Put your cursor on the inside of the folder and do the same thing we did on the desktop. 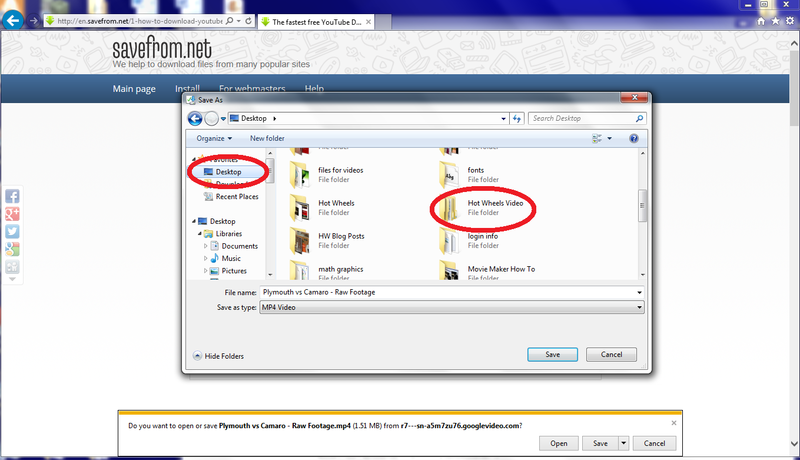 Create some new folders by right clicking on your mouse, selecting new, then folder. Let’s make three folders, calling them pictures, video, and music. You may or may not use all of them but remember, organization helps a ton. If you just throw files in a file cabinet without organizing them in folders, then after a while, you have to sort through way too many papers to find the one you’re looking for. If you organize them into folders, it is much easier to find what you are looking for. 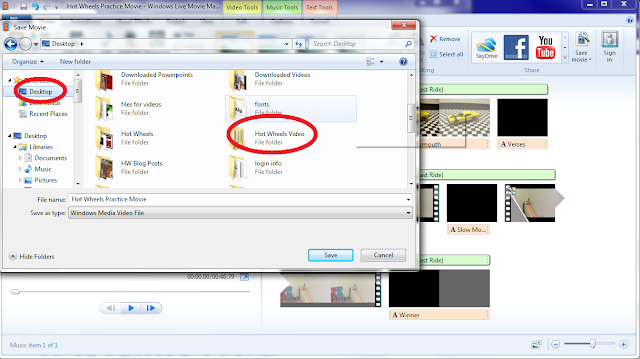 This is important because when you use windows movie maker (or any other program for that matter) and want to bring files into it, you’ll have to find those files, it’s important to know what drawer and what folder they are in and have them labeled correctly and conveniently. So first, let’s get some files to practice with. You may or may not already have some video on your computer, but so you can practice with me and use the same file as me, I’m going to show you how you can download something from youtube to your computer (an awesome thing to be able to do even if that’s all you learned today.) 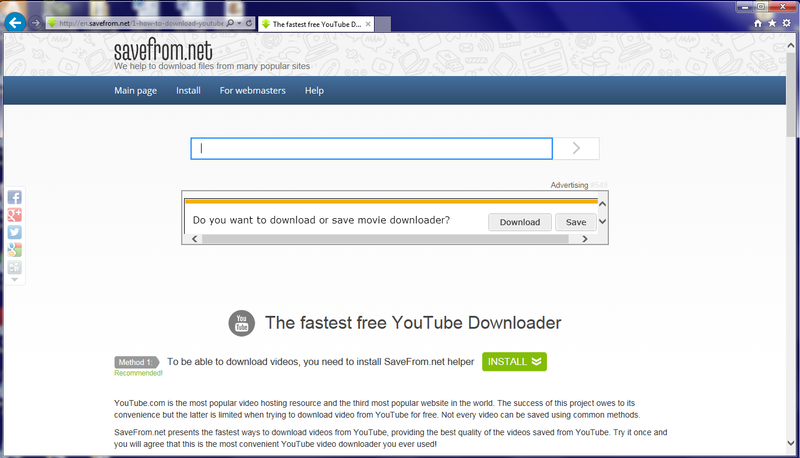 We are going to use a website called savefrom.net. 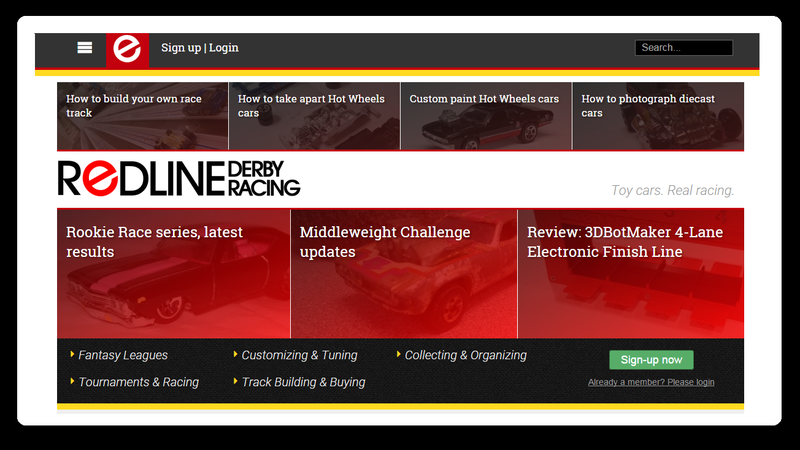 This site looks a bit different depending on the browser you are using and the browser version. 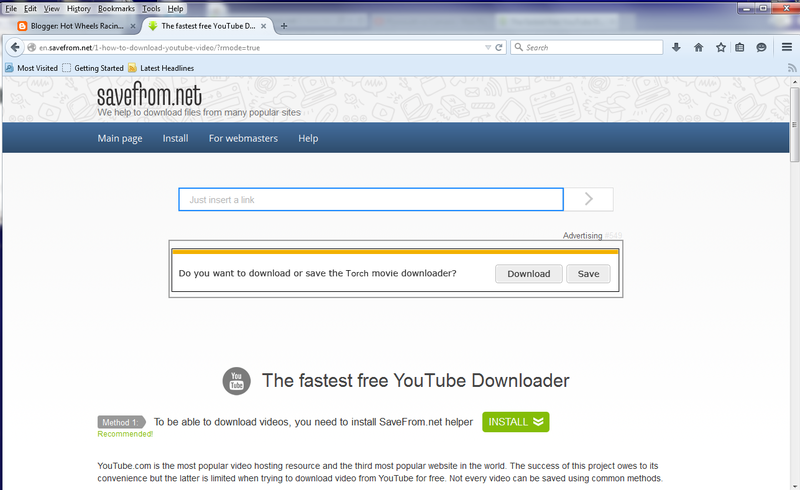 It may or may not have a download button. Sometimes it just has an arrow next to the box. Also the color of the button may be different depending on the browser you are using. 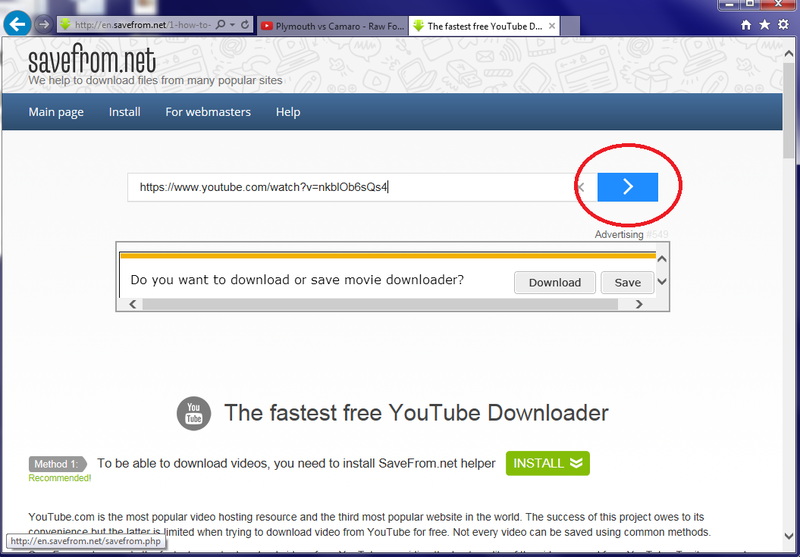 Now copy the address from the youtube website and paste it into the spot on savefrom.net that says “Enter the url, that you want to download from” then click the blue arrow or yellow download button (depending on which browser you are using). It will “think” for a minute then give you some options to pick from. Again, this may be a bit different depending on the version and browser you are using. Choose the MP4 360p one. 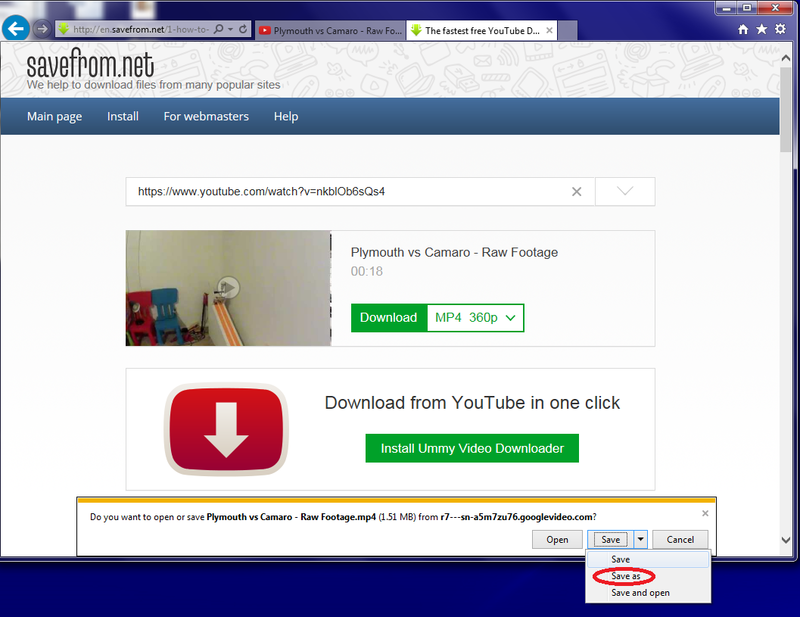 Now depending on which browser you are using how the file downloads might be different. If you are using Internet Explorer, you will see a little popup at the bottom of the screen that says Do you want open or save... with buttons to open, save, or cancel. Next to the save button there should be a little upside down triangle. Click on that and then select "save as". A window should open up. Your computer is opening your file cabinet and a folder for you to put the file (video) in. It may or may not be the right folder…most likely it is not the right folder. So now we need to find the right folder to save the file in. This is why I like to use the desktop “drawer”. It‘s easy to find. If you look over on the left right at the top you should see desktop. Click on that and it should open the desktop “drawer”. 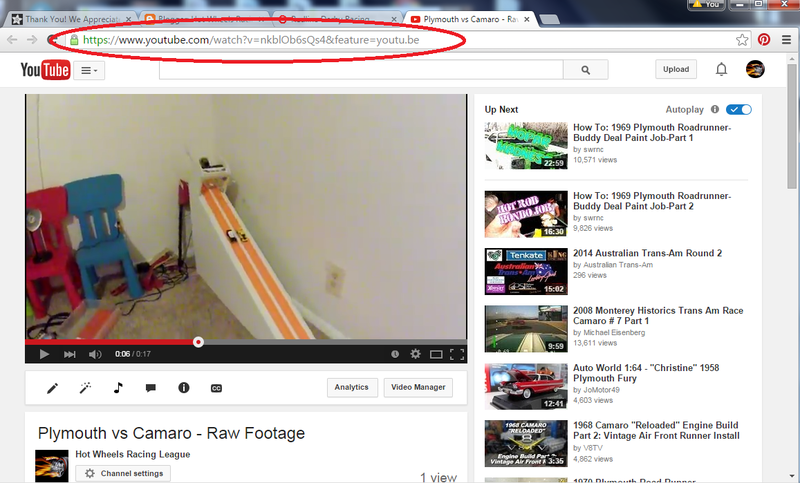 Remember that is the "drawer" we put the Hot Wheels Video folder in. We should see all the things that are in the desktop “drawer” show up. Included among those should be the Hot Wheels Video folder. Remember that’s like our green hanging folder, but inside that we have a manila folder especially for video, so double click on the Hot Wheels Video folder and then you should see your three folders that you made. Double click on the videos folder. Now you should have an empty folder open with nothing in it. Name the file whatever you like and click save and it should save the video in your videos folder. Let’s get some car pictures to use in your video. Right click on the picture of the car above. A bunch of options will come up. Click on “save image as” found a little more than halfway down. When you do this, a window will open up. 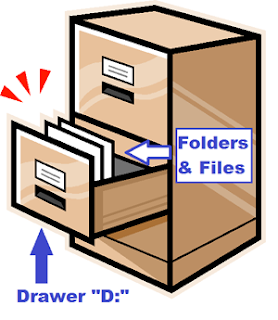 Your computer is opening your file cabinet and a folder for you to put the file (picture) in. It may or may not be the right folder…most likely it is not the right folder. So now we need to find the right folder to save the file in. This is why I like to use the desktop “drawer”. It‘s easy to find. If you look over on the left right at the top you should see desktop. Click on that and it should open the desktop “drawer”. 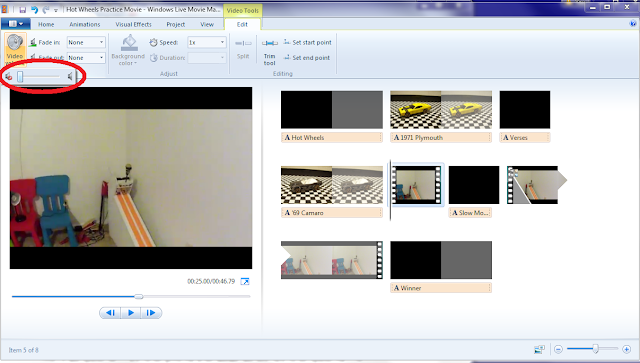 Remember that is the draw we put the Hot Wheels Video folder in. We should see all the things that are in the desktop “drawer” show up. Included among those should be the Hot Wheels Video folder. Remember that’s like our green hanging folder, but inside that we have a manila folder especially for pictures, so double click on the Hot Wheels Video folder and then you should see your three folders that you made. Double click on the pictures folder. Now you should have an empty folder open with nothing in it. Name the picture "1971 Plymouth" and click save and it should save the picture in your picture folder. Do the same thing to save the picture of the Camaro. Now we have some pictures and some video, let’s start editing. 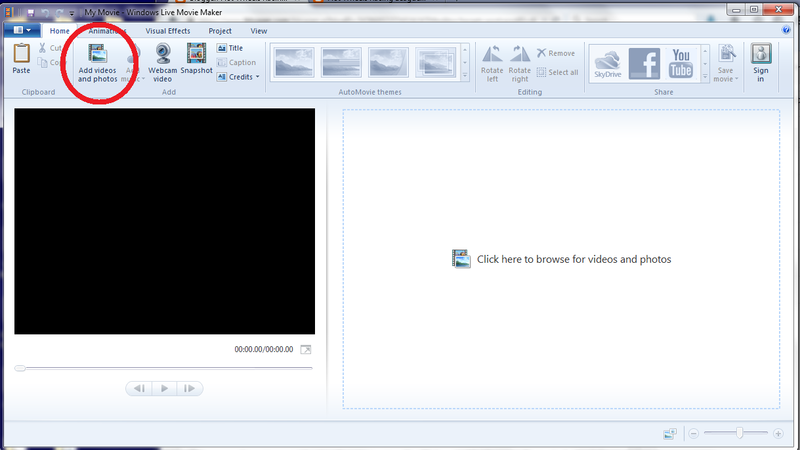 Open up Windows Movie Maker. 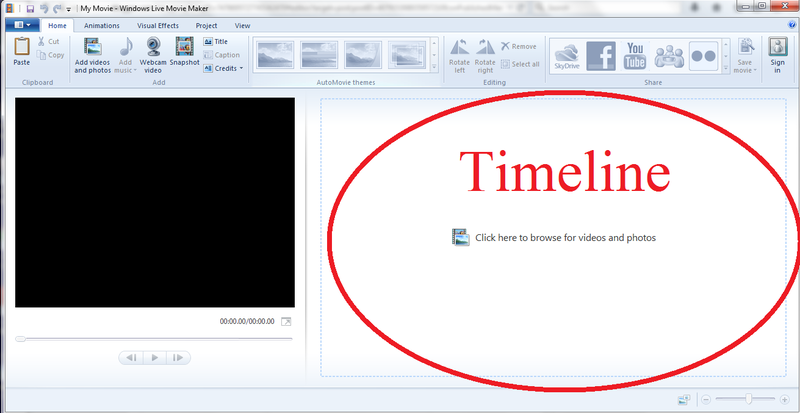 All your editing is done in what’s called the timeline. 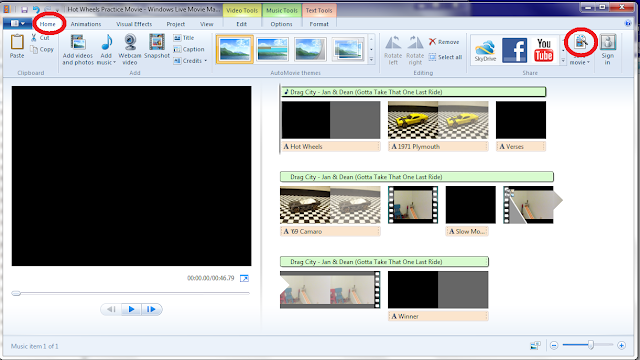 You can basically move along the timeline frame by frame if you want to and decide where you want to cut clips. To understand the timeline, think old school film strip. If there is a certain part of the film strip you didn’t want to show or see, you just take some scissors and cut it out, then tape it back together and away you go. Editing video in Windows Movie Maker is much the same way. We will go along the “film strip” and use some “scissors” to cut and then delete what we don’t want. We just don’t need tape to put it back together. 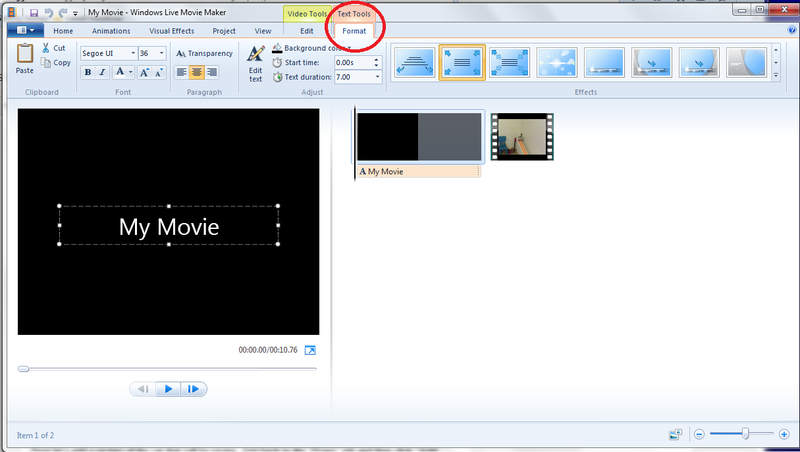 In Windows Movie Maker, the “film strip” is the timeline, and the scissors is the “split” button. First we need to get some video into the program to edit. Click on “add videos and Photos in the top left. A “drawer” and a “folder” will open. Maybe it opened to the right place, maybe not. If not, go find your file. Remember it’s in the Desktop drawer, Hot Wheels Videos hanging folder, and videos manila folder. 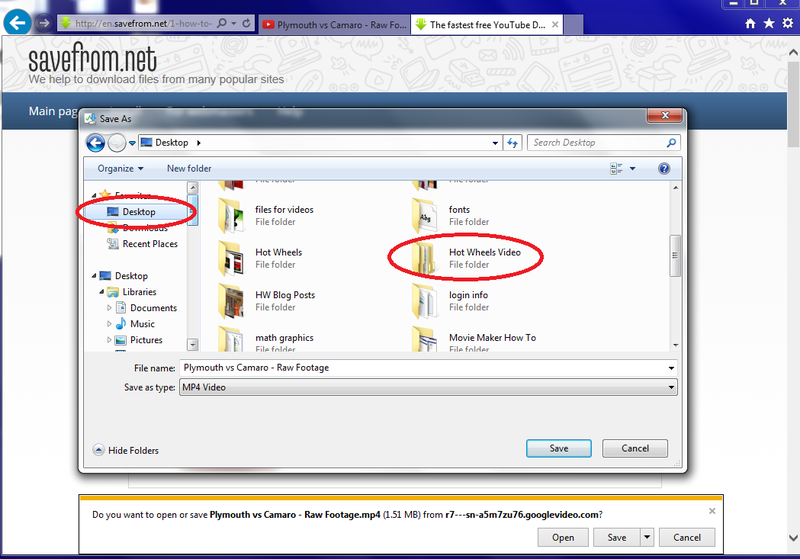 Click on the desktop at the top right, find the Hot Wheels Videos folder and double click on it to open it. 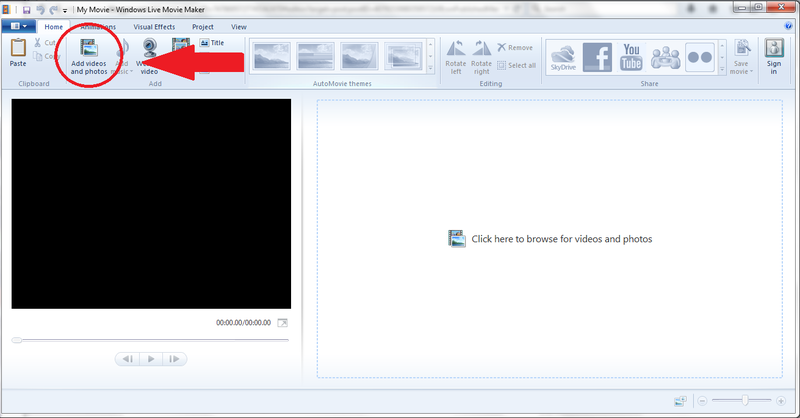 Next, double click on the video folder. 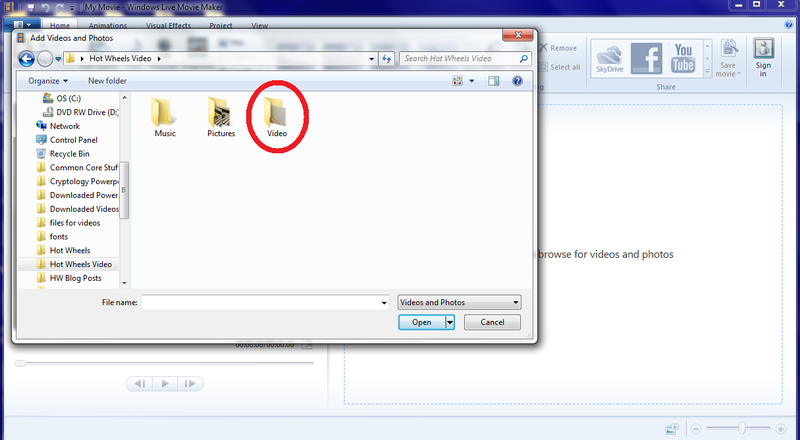 In this folder is the video file that we will be editing. 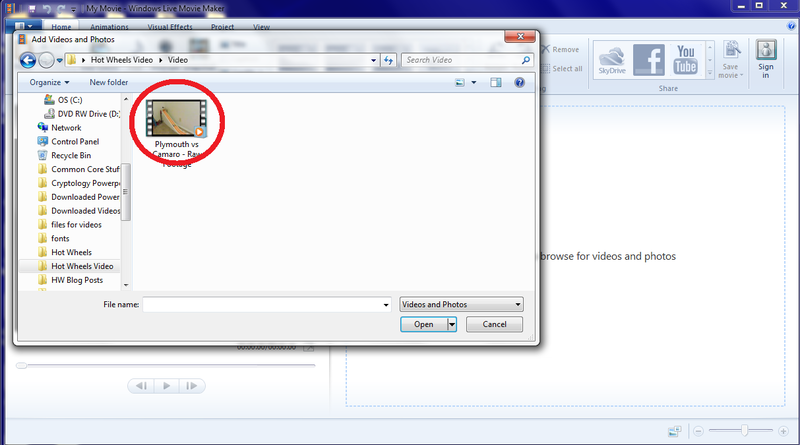 Click on the video file so it is highlighted in blue and then the open button. (Or you can just double click on the file to open it. 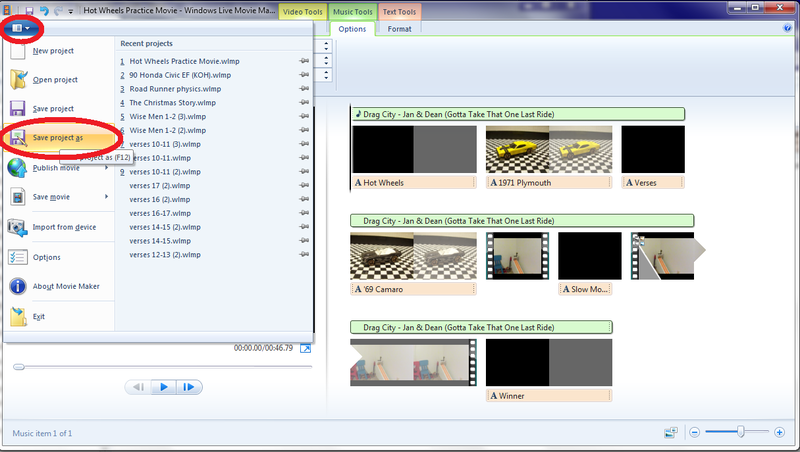 You will now see something in the timeline that looks a bit like a film strip. At this point notice which tab you are in. If you look along the top of Windows Movie Maker you will see several tabs. They are “Home”, “Animations”, “Visual Effects”, “Projects”, “View”, and “Edit”. Right now you are in the “Home” tab. To edit the video we are going to want to be in the “Edit” tab. 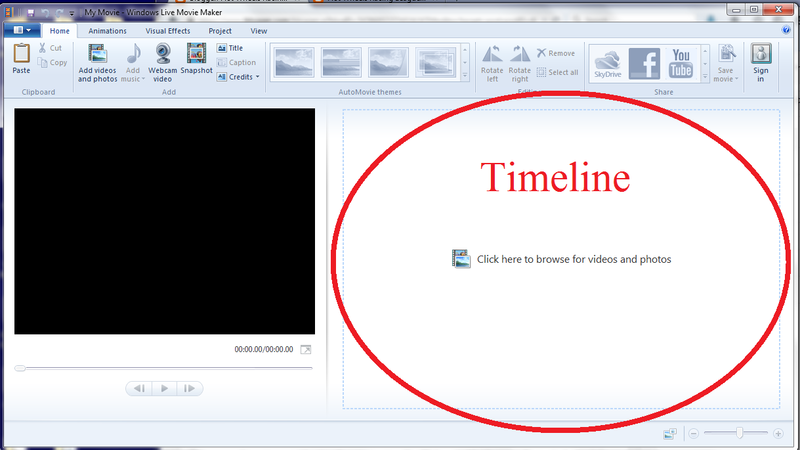 To get there, you can either just click on “Edit” or double click on the video in the timeline. If for some reason you are not seeing the “Edit” tab, click on the video in the timeline. It should show up. When you are in the edit tab and click on the video in the timeline, a line should show up. You can grab that line and slide it along by putting your cursor on it and then holding down the left mouse button. Now move the mouse to the right and the line should slide along. If you look at the screen next to the timeline you should see the video “playing” as fast as you are sliding the line. You can jump to any part of the video by click there and the line should show up there. Under the playback screen you will notice three buttons. The middle button is the play button. If you press it, the video will play from where the line is on the timeline. If you push the button on the right, the video will advance one frame. Push it again and it will advance one more frame. The left button will do the same thing only going back one frame. This is a way to get to exactly the right point in a video. In the video we are editing, there are a couple of things we don’t want in the video. When I first started the camera it was pointed at the wall. I want to cut out all the beginning part until the camera is just on the cars at the starting line. Also at the end I left the camera on for a bit and I want to cut that out. First I’m going to slide the line to approximately the place I want to start the video, then I will use the left and right buttons below the playback screen to get it exactly where I want it. Once I’ve gotten past all the camera movement and the camera is focused on the cars at the start I will now use my “scissors” to cut off that first part. The “scissors” is the “Split” button located at the top just under the “Edit” tab. Cool, now we’ve gotten rid of all that camera movement at the first of the video, let’s get rid of the part at the end where I forgot to turn off the camera. Slide the line to the end of the race and find the approximate place where you would like to end the video. Use the left and right buttons under the playback screen to get to exactly the right spot. 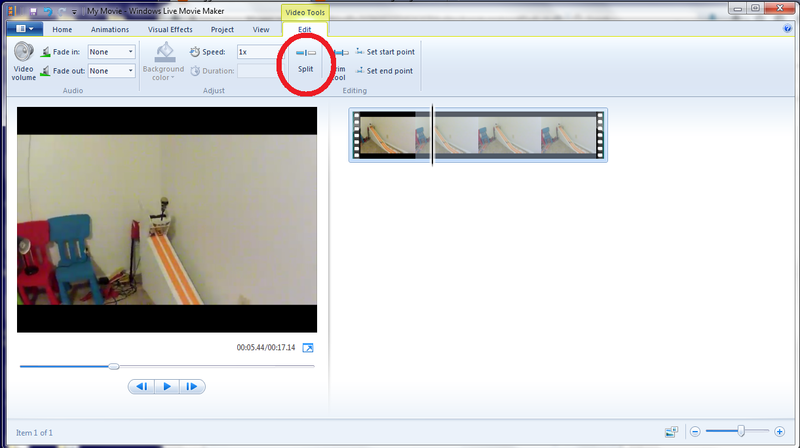 Once there, use the “Split” button to cut the clip in two. Now delete the clip on the right that has the stuff that we don’t want. Now we have just exactly the video we want. Now let’s add some titles, pictures, and some slow-mo. First let’s add a title. Make sure that you are in the Home tab. Now click on the Title button, which is the top of the three buttons to the right of the “Snapshot” button. 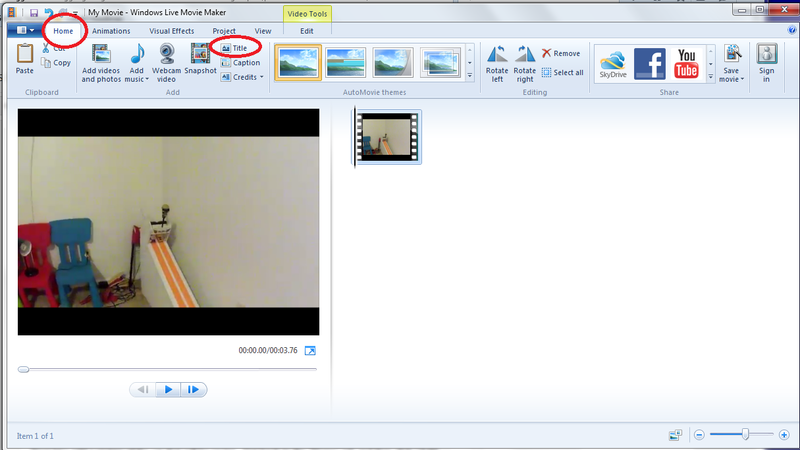 All of a sudden a black clip shows up on the timeline in front of my video clip with “My Movie” in the playback screen. We can change that by just deleting the text “My Movie” and writing our own title. Also notice that we are in a different tab now, the “Text Tools” and “Format” tab. Notice some of the things we can do here. We can change the font, size, and color of our text. We can also center, left or right justify. We can also change the background color (black is the default). To the right of that are different ways that the text can be animated. Just hover your mouse over some of them (you don’t need to click on it) to see different ways that the text can show up. When you find one you like, click on it. Now try this. Click on the racing video clip. Notice that the “Text Tools” tab and “Format” tab go away. Now click back on the black title clip. They come back, but you probably aren’t “in” that tab. You’re probably in the “home” tab. Click on the “Format” tab and you will then see all the text editing options again. Let’s say that I changed my mind and want to change the title. Click on the “Edit Text” button and you should be back to where you can change the text. You now have two clips if you click on a clip you’ll notice that the clip is highlighted in light blue. I’ll refer to this as selecting a clip. Next let’s add a picture of the cars that will be racing. Get back to the “Home” tab and then click “Add videos and photos”. A “folder” will open. It may or may not be the folder you want. Remember where our stuff is. 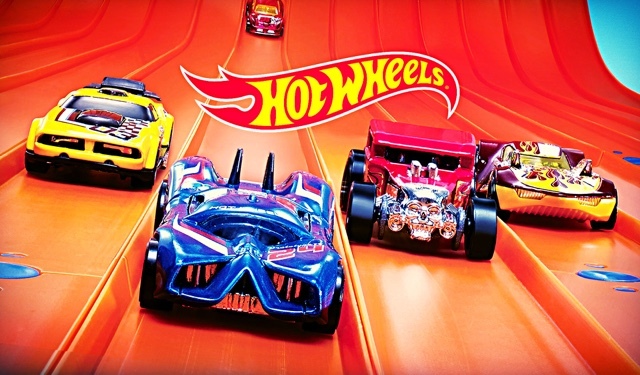 Desktop – Hot Wheels Videos – Pictures. Click on the picture, then open, or just double click on the picture. The picture will be inserted after the clip that was “selected”. If you had the title clip selected, then it showed up after that. If you had the racing video clip selected, then it showed up after that. I purposely had the video clip selected so I could show one more thing. I want to move the picture clip to be after the title clip, so I can just click on it and hold the mouse button down, then drag it to where I want it. Now I would like to overlay some words on the picture clip. I’m going to use the “Caption” button. This is the middle of the three buttons to the right of the “Snapshot” button. Make sure the picture clip is selected by clicking on it. Next click the “Caption” button. You now have the option to edit the text of the caption just like we did with the title. Since we have two cars racing, let’s add the picture of the other car. Click on the car picture so that the new car picture will show up after it. Make sure you’re in the home tab. 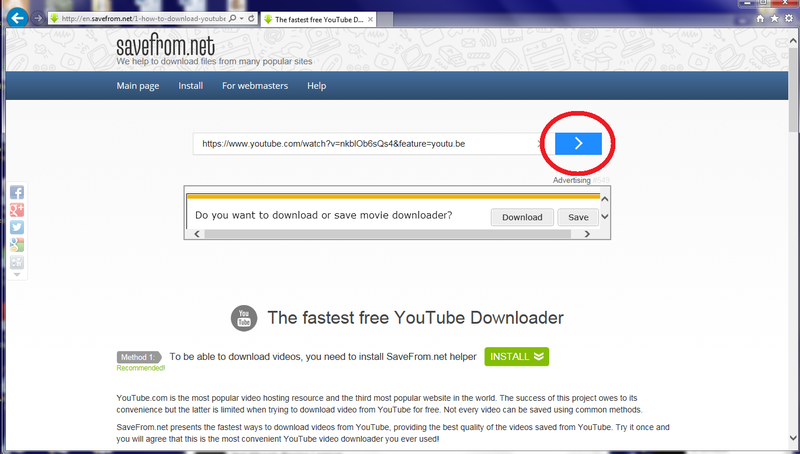 Click on the add videos and photos button. Find the picture (Desktop – Hot Wheels Videos – Pictures). 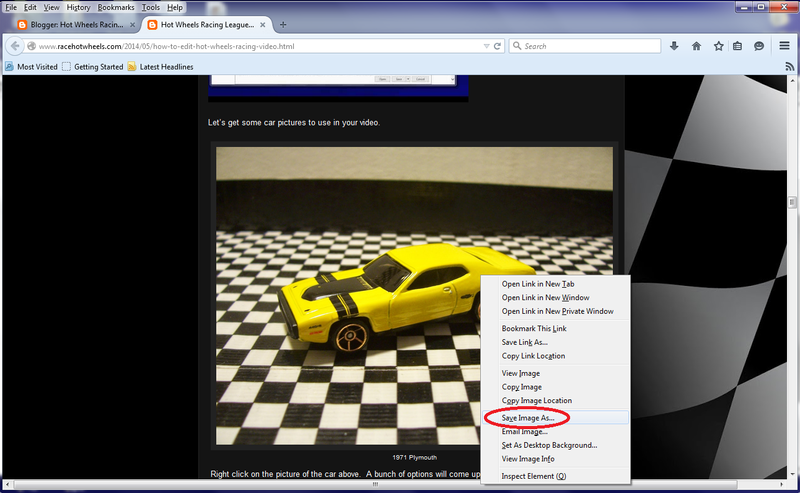 Double click on the car picture and it should be inserted. Add a caption by clicking on the caption button and changing the text. Now remember that the default length for these title clips is 7 seconds. That’s going to seem kind of long to read the word verses, so I’d like to shorten that down a bit. Make sure that the verses clip is selected by clicking on it. By doing that it will probably take you to the “Text Tools” and “Format” tab. Click on the “Edit” tab just next to the “Format” tab. This will let us edit the clip itself and not just the text. Notice there is a box labeled “Duration” with a 7.00 in it. That means 7 seconds. Let’s change it to 4 seconds. Click on the little upside down triangle and a little drop down menu comes up. Select 4.00. You can also just click on the 7.00 and then type the time you want in the box. Great, now let’s add some slow motion video. We could just change the race we have to slow motion, but I like to see the race at real speed then slow it up. So what we are going to do is to copy the race clip and paste another one right behind it. We could use the “Add videos and photos” button and insert the clip again, but then we’d have to edit it by cutting off the stuff at the beginning and the end. Since we have a clip that is what we want, just copy and paste it. To copy the clip, click on the clip to be sure it is selected. 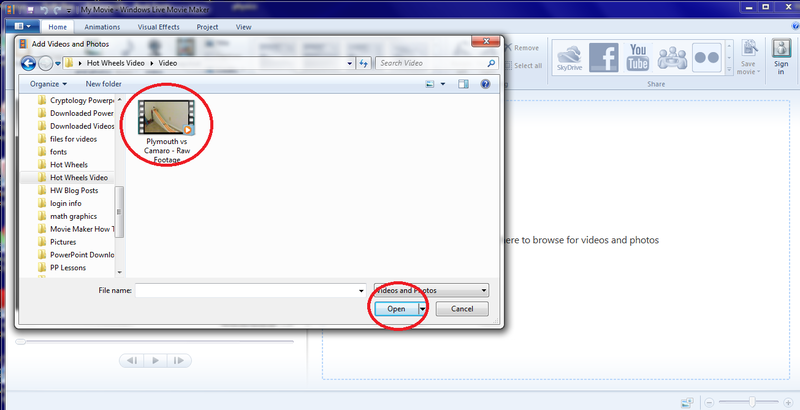 Then right click on the clip and select copy on the menu that pops up. 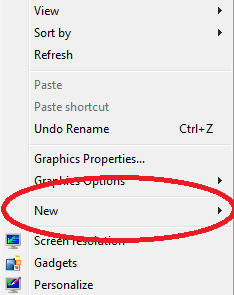 Then right click again and select paste on the menu that pops up. It should paste another copy of that same clip right after it. This is the one we are going to slow down. Click on the second clip so it is selected. Next click on the “Edit” tab at the top so that we can edit the clip. Once you are in the “Edit” tab you should notice a box labeled “Speed” with a 1x in it. This means that the clip will play at normal speed. Click on the little upside down triangle and a drop down menu should show up. Numbers larger than 1 will speed up the clip, and numbers less than 1 will slow it down. I’m going to pick 0.25x for this tutorial, but you can choose whichever one you want. (.0125x is the slowest). Voila, our clip is slowed down. To see what it looks like, slide the line to the beginning of the clip and press the play button. It will play the clip at whatever speed you’ve chosen. I usually find that when I slow the clip down, there is a lot of time at the first just watching the cars sit in the start gate. There is also a lot of extra time at the end. 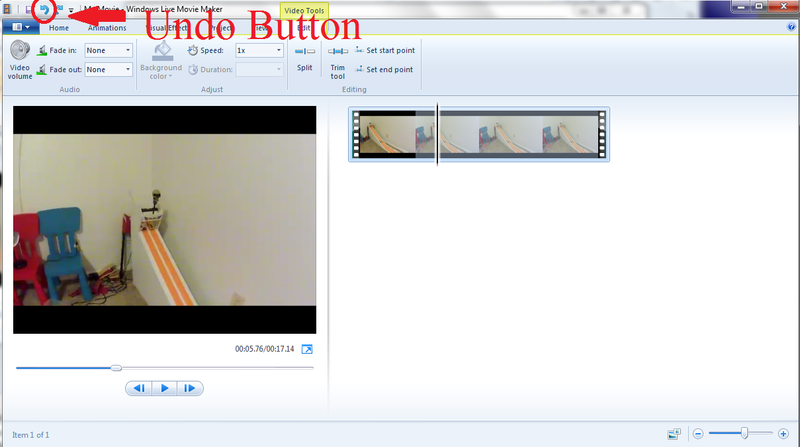 I’m going to do a little more editing using the Split tool and the left and right buttons under the playback screen. Now using the skills that you’ve learned, see if you can add a title clip between the two clips telling us some slow motion is coming. Let’s talk about one last editing tool. Transitions. Click on the slow motion video clip. Next click on the “Animations” tab. There are a bunch of transitions, not all of them work well with different combinations of still pictures and video. You mostly just have to try and see if it looks good. If you put your cursor over a particular transition it will show you a sample of how it looks. The one I use the most is the crossfade. If I click on crossfade it will select that and then use the transition between the "slow motion replay" title and the slow motion race video clip following it. The last thing I'm going to do to my video is add some music. To add some music to your video, you first need to have some music on your computer. 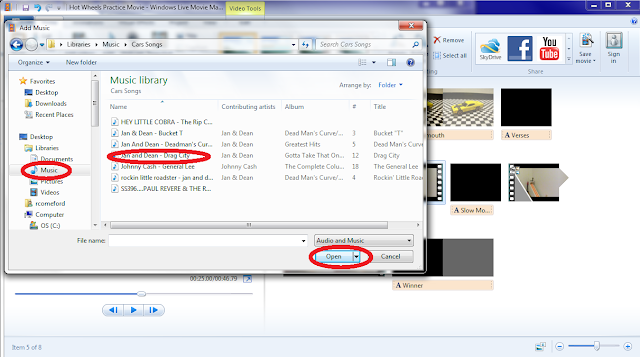 Your computer probably has a default music folder that it came with where all your music is. 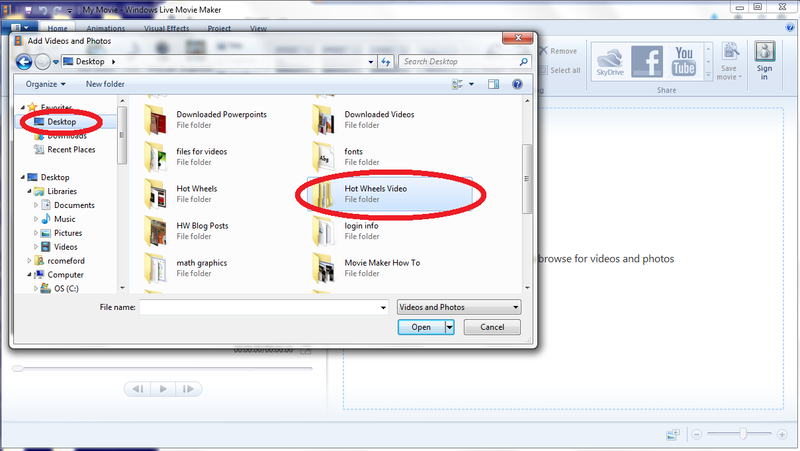 If you want you can drag the song you want to the music folder that we made in your Hot Wheels Video folder, or you can just import the music file to Windows Movie Maker straight from the default Windows music folder. That's what I''m going to do. The second thing you need to be aware of is the sound in your video clips. If you want the sound, that's fine, but usually I get rid of the sound if I'm adding music. You will only have to worry about that with the video clips, as titles and pictures don't have sound. 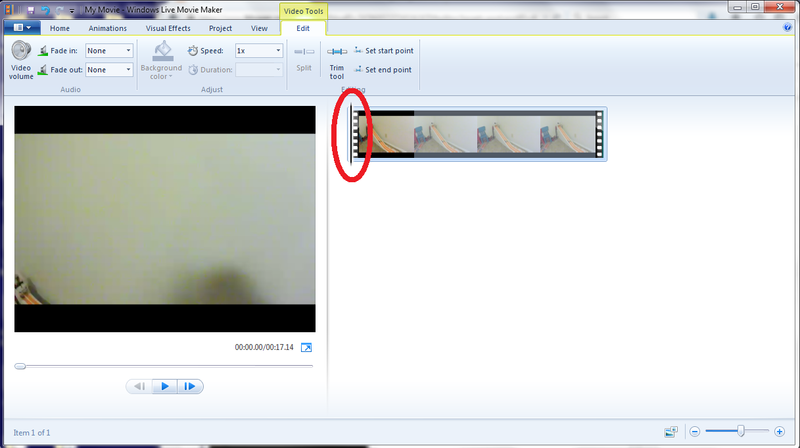 To get rid of the sound, click on the video clip, then the "Edit" tab. Over on the left you should see a button that says "video volume". Click on that and then slide the bar all the way to the left. This is where you can also just turn the volume down or up, but all the way to the left is silent. Slow motion video doesn't usually have sound, but I turn it all the way down on that clip too. Now let's add some music. In the "Home" tab, click on the "Add music" button. A window will open up. Remember, you're looking for the music folder. Click on the music folder and then find a song you like. Click on the song and then click on open. The song will be put into the video. It will be represented in the timeline as a green bar above your videos. If you will notice at the top, there is a new tab. Under "Music Tools" is and options tab. Click on the green bar in the timeline and then click on the options bar. The option that we want to use is "Fade out". 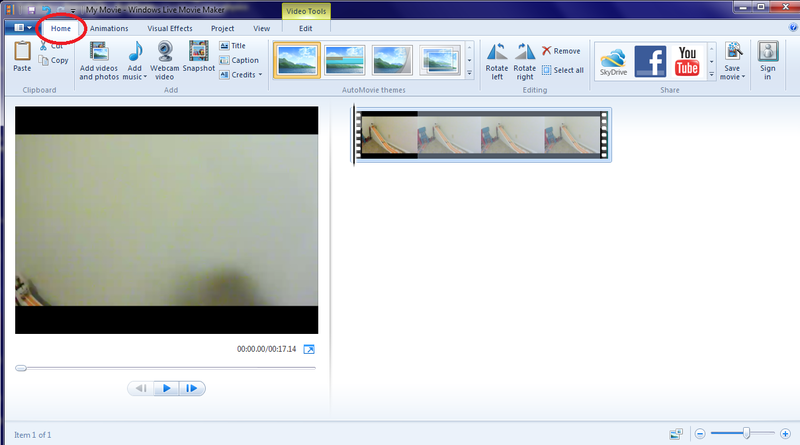 This will make it so the song doesn't just abruptly end at the end of our video. I'm going to go with a Medium Fade Out. Click on the upside down triangle in the box next to "Fade Out" and then select "Fast", "Medium", or "Slow". Great! We've got a cool tune to listen to while watch the race! 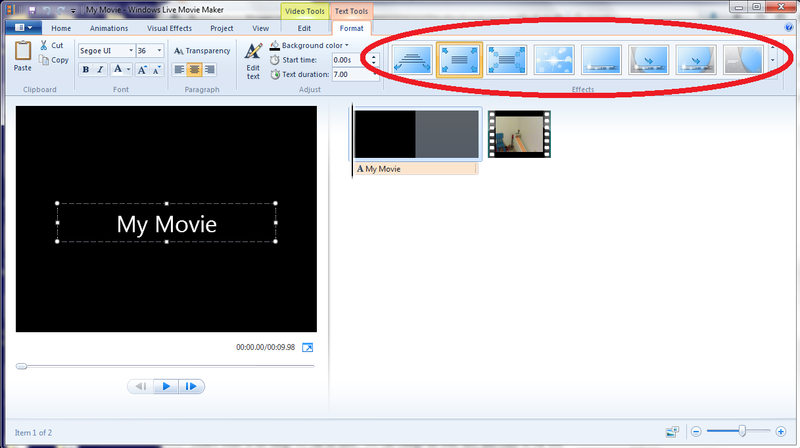 There are a few other things that Windows Movie Maker can do. But you should have the basics down. From here on, just experiment and have fun. Try some different transitions and animations. Play around with titles and captions a bit. Just remember, you can always hit the "undo" button if you do something wrong or that you don't like, and always remember to save! There are two kinds of "saving" that you will do. One is to save the project. This will allow you to open Windows Movie Maker and continue to work on the project. To do this Click on the blue button with the upside down triangle in it to get some menu options. Choose "Save Project As". A window will open. It is now asking you where you would like to save it. 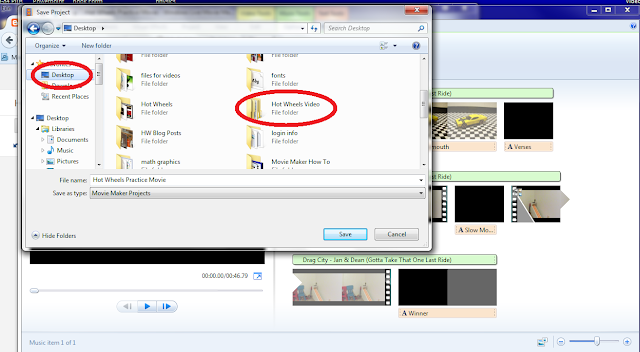 Save it to your "Hot Wheels Videos" folder on your desktop.Click on "desktop", then double click on the "Hot Wheels Video" folder, then click save. The second kind of "saving you will be doing will actually "produce" your video so that you can watch it or upload it to Youtube or other sites. 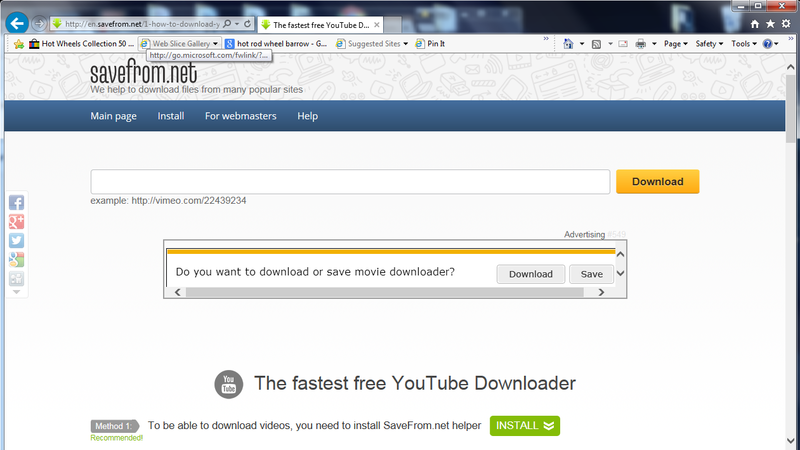 In the "Home" tab find the "Save movie" button at the top right. If you click on the upside down triangle you will get some different options for saving your movie, but for now let's not mess with that. Just click on the picture part of the "Save movie" button. A window will open asking you where you want to save it. Let's save it in our Hot Wheels Video folder on the desktop. Click on Desktop, then double click on the "Hot Wheels Video" folder, then click save. That's it! To watch your video, close Windows Movie Maker, open the "Hot Wheels Video" folder on the desktop, double click on the movie file you just made and enjoy! Does your video look like mine?